I’ve often said roundhouses are the easiest, quickest way to build small houses. I did a quick search of roundhouses built with sustainable materials and was pretty amazed at all the possibilities. For instance, here’s a site with roundhouse photos. A search of my Earthbag House Plans site shows roundhouses with a yurt roof, a study, roundhouse above survival shelter, double unit ecoresort and a Hobbit house to name a few. My Earthbag Roundhouse Instructable is popular. 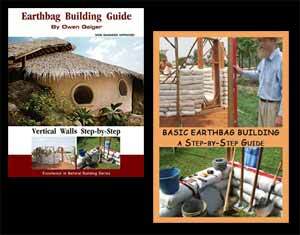 There’s also the Straw Bale Yurt Bible and many other possible designs. 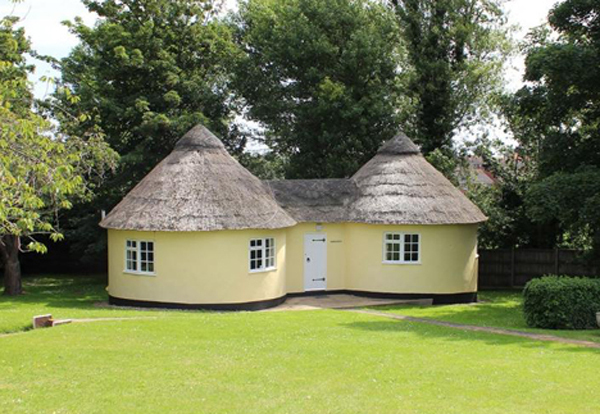 Here are my latest ideas to build a small, fast, easy and low cost roundhouse. While you could use subsoil, lava rock and lots of other materials, for this example we’ll use rice hulls because they’re extremely easy to work with. – Richard, a long time reader, likes the idea of using rice hulls packed in 18” raschel mesh bags or tubes placed ‘on edge’ to create a 10” thick wall. – set 16 evenly spaced roundwood posts in concrete footers (plus 2 extra for the door). Wrap plastic sheeting around base of poles to separate wood from concrete. – recycled doors, windows, etc. As a daily follower of this site, I’ve noticed a couple of things that differ in this idea from what I’ll call the standard earthbag technique I’ve often seen you mention. 2. In most of my research, and in your book – the standard 18×30 poly bags are doubled up and used for the gravel courses. I have often wondered if the strength of the mesh tubes is sufficient to deal with the stress of the gravel being tamped. If so – what a breakthrough that is, seeing as so much time can be saved, as well as bag material. I remember seeing your video on the mesh bags – you called it the hot new development in earthbag building. Rubble trenches could possibly be omitted in this case since the walls are super lightweight. The loads are carried by the posts. Use wide roof overhangs or wrap-around porches to keep water well away from the building. Build on high ground so water drains away from the building in all directions. There will be less weight on the gravel bags and so they don’t need double bagging. Raschel mesh bags should work with gravel although I haven’t tried it.